As you get older there is a pretty good chance you are taking more medications to try to ease some of the discomfort you feel as you head into your golden years. However, you might not have guessed that some of these same medications can also lead to falls – and falls can mean serious injury, hospitalization, even loss of independence. A new Swedish study, published in the European Journal of Public Health, has revealed that medications like painkillers and antidepressants are closely associated with injuries due to a fall. “Medications that affect the central nervous system; hypnotics, sedatives, analgesics and antidepressants,” were of particular concern, the study’s lead author Jette Moller, of the Karolinska Institute in Stockholm, told Reuters. By looking at the falls of nearly 7 million Swedish people over 65 who take one of the 20 most commonly prescribed drugs (some known to increase the risk of falls) Moller and other researchers identified 64,399 cases of falling injuries that led to hospitalization. After taking into account the number of medications participants were taking, they learned that men and women taking painkillers, as well as the men taking antidepressants, were twice as likely to fall and injure themselves as seniors who weren’t taking those drugs. In fact, women who were taking the antidepressants were 75 percent more likely to sustain an injury from a fall. There were others, such as estrogens and certain heart medications, that didn’t increase the risk of falls. Today, more than 40 million people in the United States are over 65, according to the National Center for Biotechnology Information. 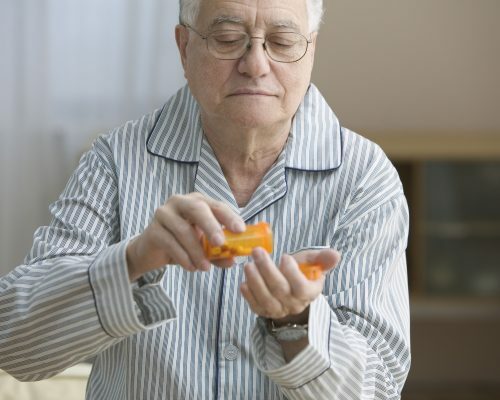 Seniors typically take a number of prescription drugs and at least one-third takes eight or more medications every day. Yet falls are a leading cause of disability and death among this age group. That’s why this information becomes particularly important. Of course, the Swedish study can’t support the notion that medications lead to falls in all cases. For one thing, the underlying conditions some drugs are prescribed to treat may have been the culprits. Some of these include blood clotting and peptic ulcers. So differentiating between falls caused by disorders, and those caused by medications, is something that might need further discussion. In future, studies will likely take into account the various dosage levels of medications because these were found to vary considerably, with some differences seen when looking at gender, too. Researchers should also look at the interactions between drugs, including those taken over-the-counter without a prescription, which may lead seniors to fall more frequently as well. In the meantime, given the number of seniors, researchers say that the link between medications and fall injuries should be considered by doctors whenever they prescribe popular drugs. Seniors should also make informed decisions about the medication they take. People who are most concerned about the risk of fall injury should ask their doctor to complete what’s called a drug utilization review, with a special focus on fall-inducing drugs. They should also pay close attention to other symptoms brought on by these drugs. These include dizziness, drowsiness, vertigo, motor impairment, muscular weakness and cognitive impairment. After all, fall injuries are a serious threat to seniors’ physical health and well-being, and they shouldn’t be taken lightly!